1. The largest and coarsest pieces of placer gold (nuggets, "chunkers," etc.) are usually deposited in the uppermost reaches of gold-bearing streams. This isn't rocket science by any stretch since the farther placer gold travels the more it gets beaten, flattened, smoothed, and otherwise reduced in size and coarseness. One exception to this rule is that additional placer source points (e.g., veins eroding nearby) located downstream will act as generating locations for new coarse gold and nearby stream sections will have a similar type of deposition as the upper stream reaches already mentioned. This premise is also true in the strictest sense when it comes to dry placers in arroyos and washes...however, most dry placer gold is coarse anyway and seldom travels any great distance unless exposed to severe flash flooding events. 2. 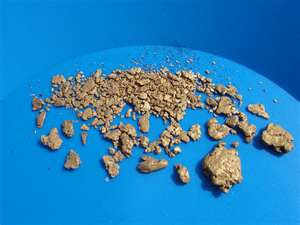 Coarser gold will invariably be found in conjunction with larger and coarser gravels. Again, this is pretty much common sense. Many mining newbies make the mistake of focusing their attention on sandier areas where only small rocks, gravel, and fine sediment are found. The old timers referred to this sort of material as "blow sand" and wouldn't touch it with a 10-foot pole. If you find anything at all in "blow sand" locations it will be only very fine or "flour" gold. 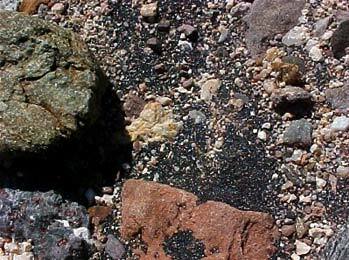 Your prospecting and mining efforts should be focused on areas (in both wet and dry placers) where there is an abundance of various-sized rock and gravel and coarser sediments. This means an assortment of smooth (water-worn) and angular rock and gravel as well. Here's the rule of thumb: the more varied and the larger and coarser the stream material, the coarser the gold. 3. More coarse gold is found in narrow stream courses or washes than in those that are very broad or wide. The reason for this is quite simple: narrower streams or washes tend to have more "choke" points and coarser gold is more likely to get trapped or "packed up" before it can move great distances downstream. A major exception here is any narrow stream or wash that is configured like a chute will NOT hold good gold. Here, even the coarser stuff will be swept downstream in most instances. Remember, these are general rules only. I've experienced numerous situations where the above didn't apply...at least not consistently. That's Ma Nature playing her tricks on you, so get used to that fact. However, about 75%-80% of the time these rules will apply to just about every mining situation you come across. So stay out of the "blow sand." If you liked this post, you may want to read: "Tips on 'Seeing' Where the Gold Is (Part 1)"